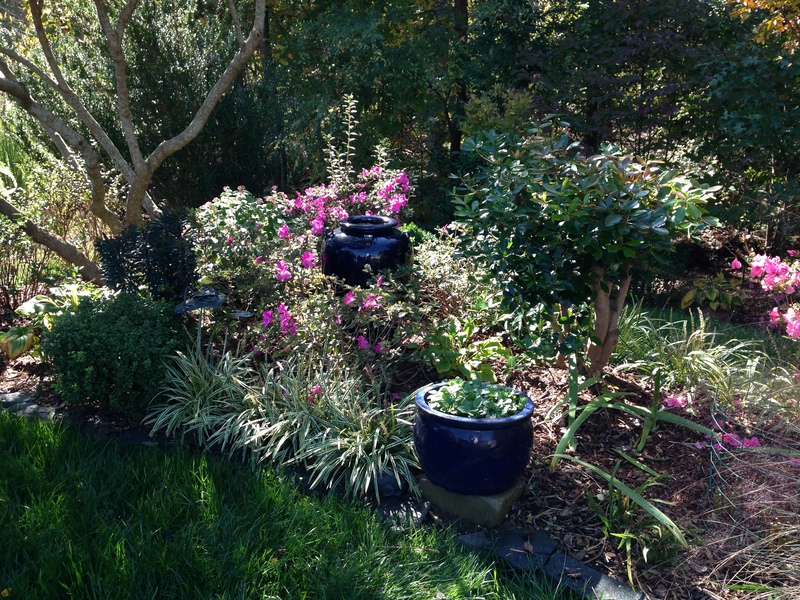 I am pleased to join Helen at The Patient Gardener’s Weblog for the first time to offer an End of the Month View of my garden on October 31, 2014. 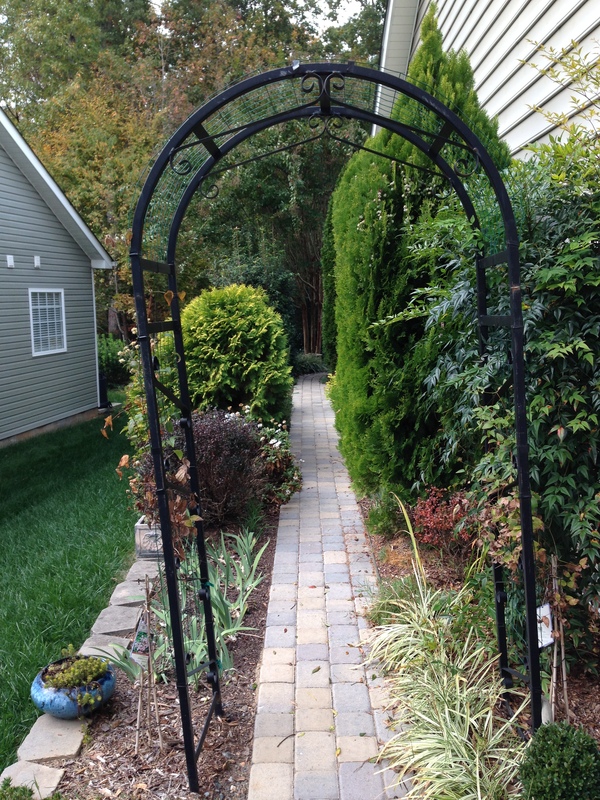 The structure of my back garden could be described as formal…at least as far as the hardscape is concerned. 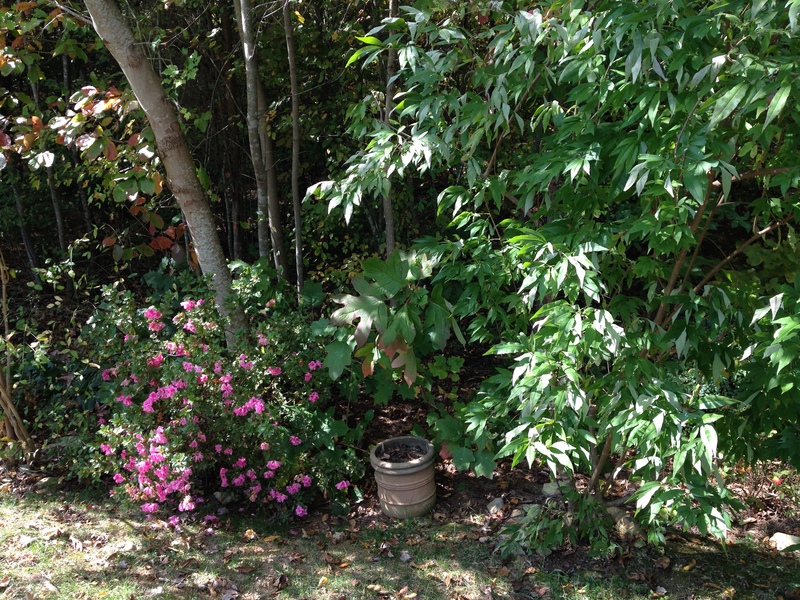 It is a circle (with a Japanese maple) within a turf ellipse within a rectangle. In the four corners are identically shaped beds defined by the ellipse and rectangle, but planted with combinations of trees, shrubs, perennials, grasses and vines. Surrounding the rectangle are grass paths and various trees. 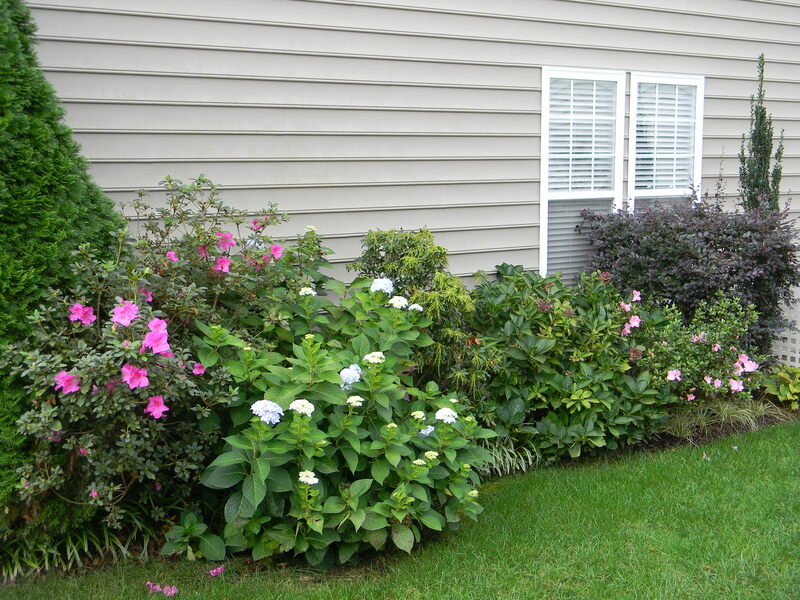 Except for a yearly planting of a mandevilla vine, I only include annuals in pots, many of which are “planted” in the beds. 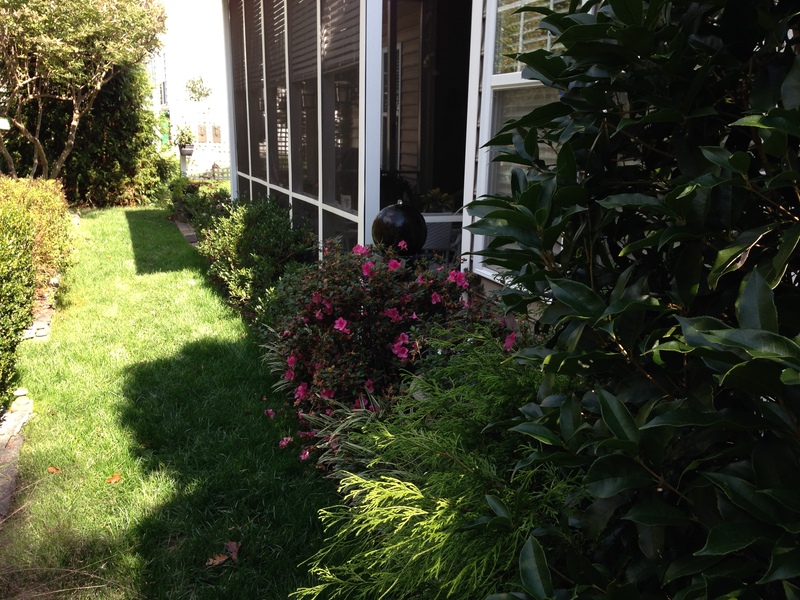 Limiting annuals to pots makes it much easier to change from winter annuals to summer annuals and back. 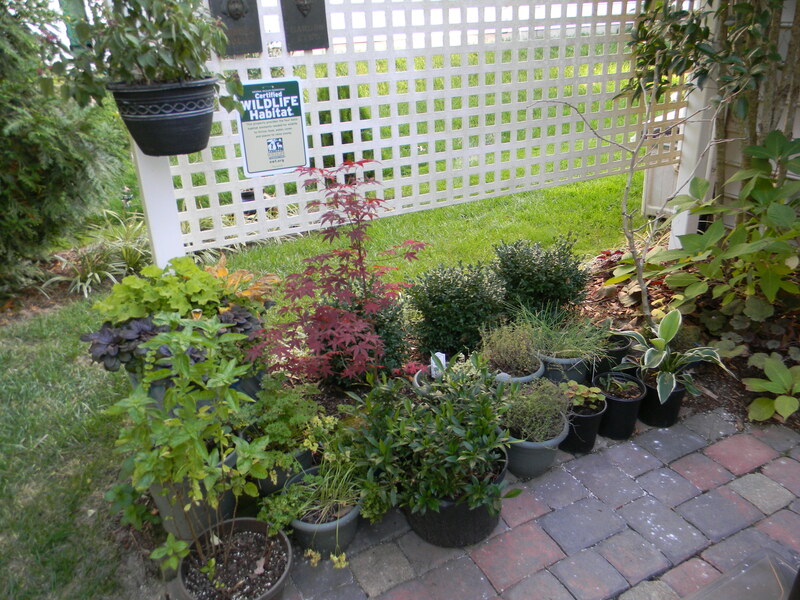 I don’t have to do the digging for each exchange, and I can put in fresh soil with the new plants. On the sunny side of our home we have constructed a stone path and wall to account for the steep dropoff on that side. 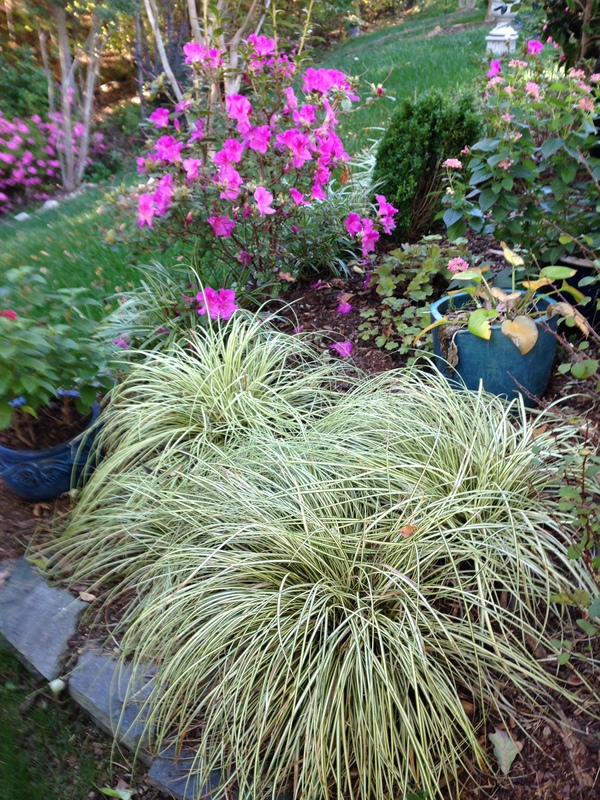 The path divides two narrow planting beds. Hindsight suggests I should have made the beds wider. I have already had to change out a few plants that grew too large for their place and I still have to do much pruning to keep the path clear. 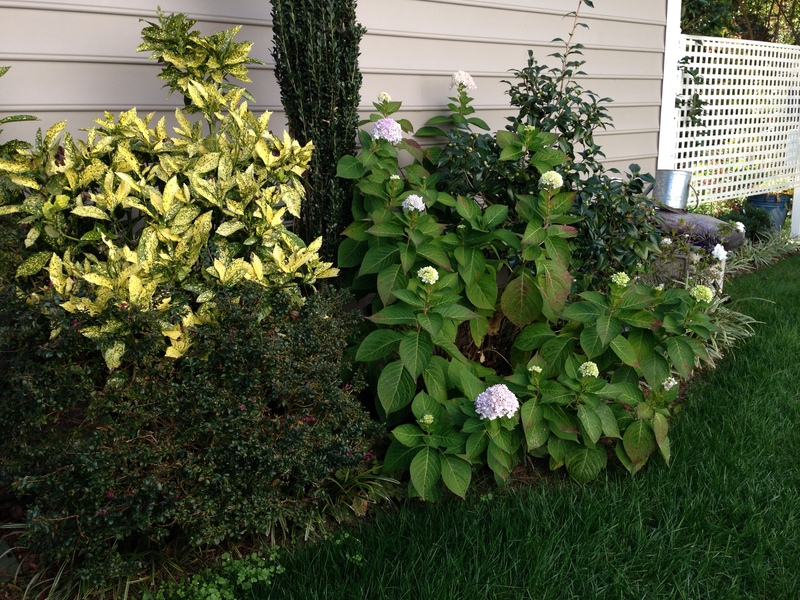 The bed on the other, north side of the house was shown in an earlier post, and is still in bloom with Encore azaleas and ‘Endless Summer’ hydrangea. A second bed near the back of the house on this side contains aucuba, an unidentified dwarf crape myrtle, ‘Blushing Bride’ hydranga, ‘Sky Pencil’ holly, and ‘Gov. Mouton’ Camellia japonica. Along the back of the house and screened porch is a narrow bed with Encore azaleas, tea olive, and dwarf gardenias which, when in bloom, give a wonderful fragrance on the porch. The fountain is one of our favorite items in the garden; occasionally gold finches will perch and grab a sip from the bubble on top. 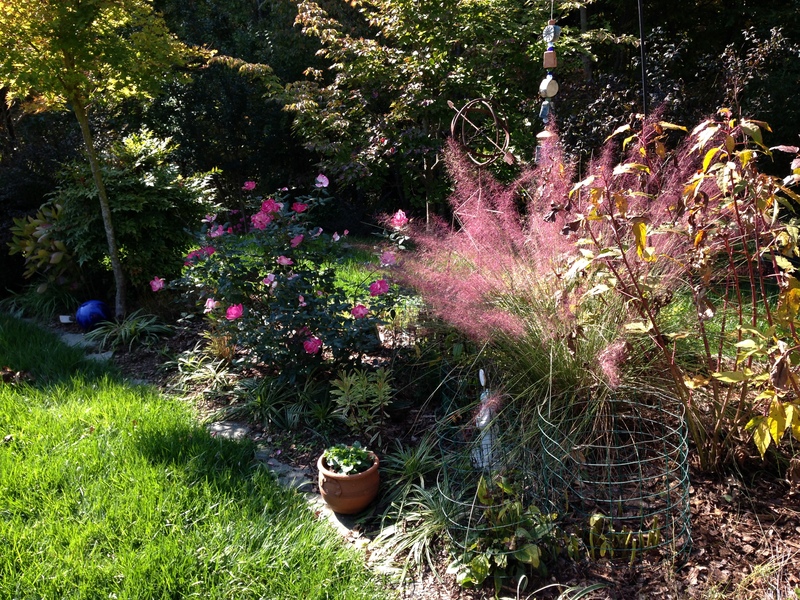 At the back of the garden are the woods, along the edge of which I have planted perennials and shrubs. 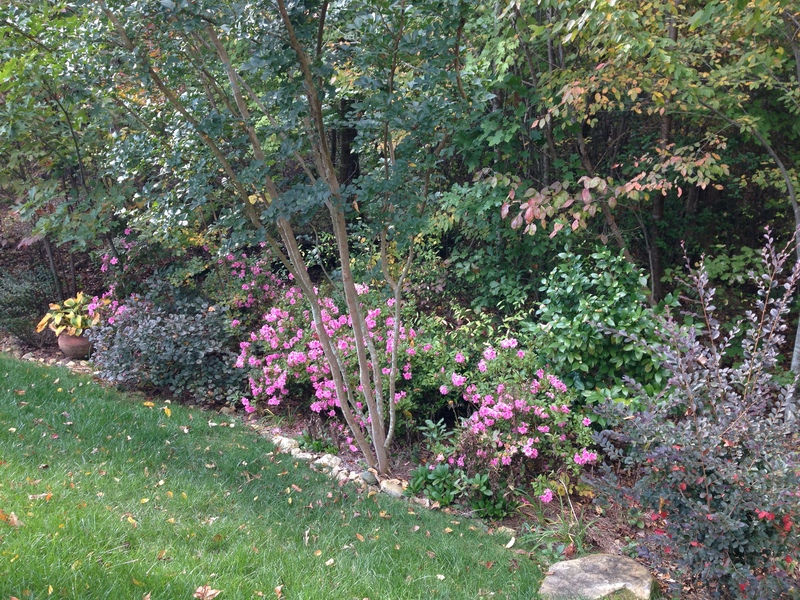 Most of the plants are going into their winter doldrums, but the Encore azaleas are still going strong. This has been their best year for fall color. A pink Camellia japonica is loaded with buds which should brighten our winter. We have put together a small herb garden in an area next to a small patio. Again, I have elected to grow our few herbs in pots, as I don’t have an appropriate place to build a permanent garden for them. Other plants that are waiting to be planted elsewhere may show up here from time to time. 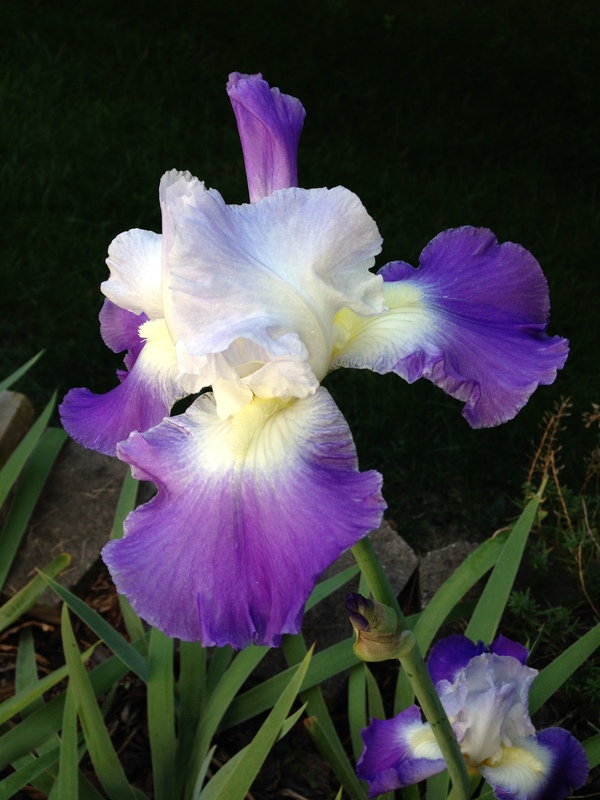 The star of the garden right now is ‘Clarence,’ a reblooming German bearded iris. 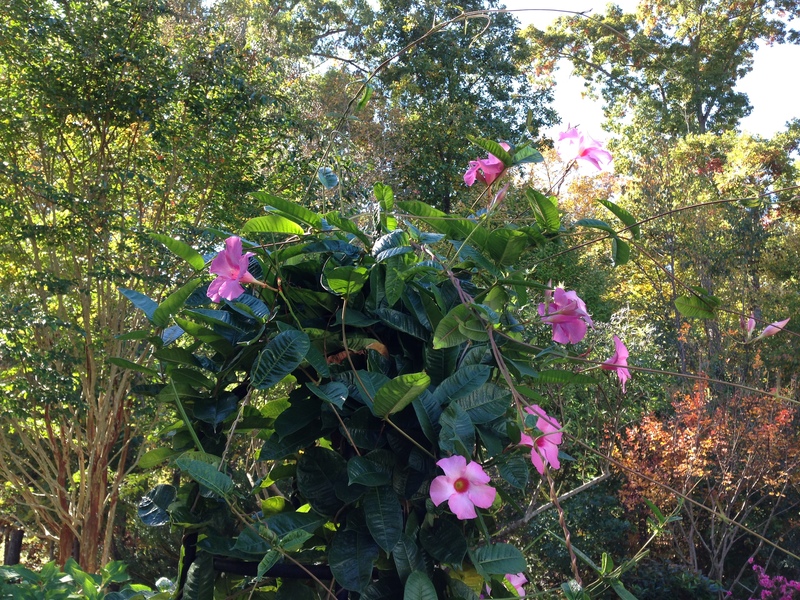 This is the first year of many that it has made it into full bloom in autumn. It has put up scapes with buds, but invariably the frost came before it opened. 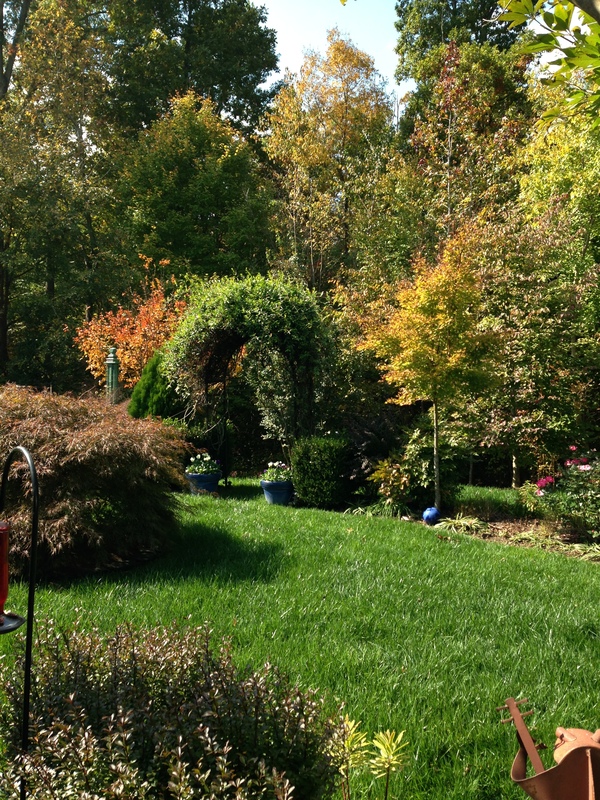 I have already cut back the peonies and siberian iris, but many things are still in bloom or have taken on their fall color. We have been blessed with a warm October with adequate rainfall. Temperatures are dropping, the leaves are falling off the trees, and the maples in my neighborhood are blazing red. Just a few more chores and I’m ready for the cold weather. 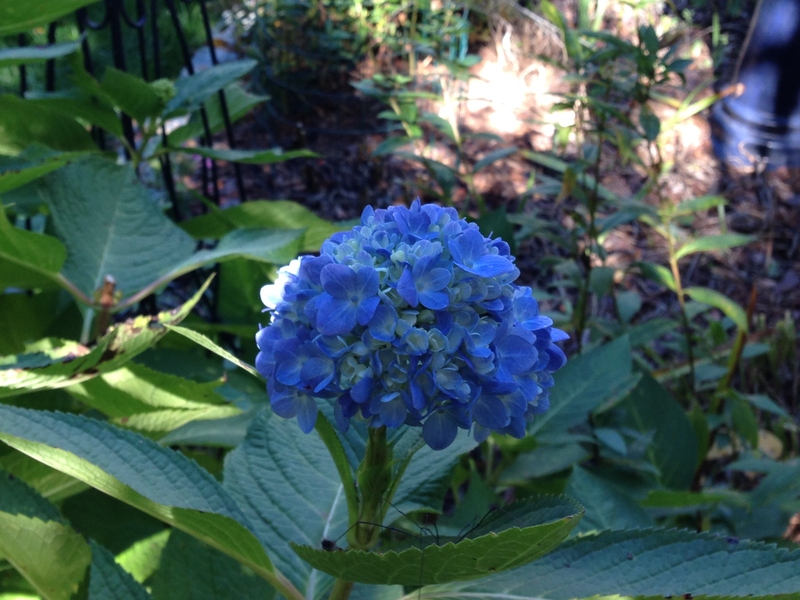 Please visit Helen at The Patient Gardener’s Weblog to see what is happening in her garden at the end of October. This entry was posted in End of the Month View, Gardening and tagged Clarence bearded iris, End of the Month View, garden, garden design, garden structure, Helen, herb garden, mandevilla, paths, peonies, perennials, reblooming iris, shrubs, Siberian iris, The Patient Gardener's Weblog, trees, vines. Bookmark the permalink. What a beautiful view of the back garden. And everything so trim and tidy, mine is a bit of a mess I’m afraid. Our weather took a turn last night; we had snow this morning! Thanks, Marian. Close ups would have revealed a garden much less tidy. There was talk of snow here, but I guess it went up into the mountains. All we have is cold and rain. Lovely garden and welcome to the meme. It’s funny how reading others blogs makes the most obvious thing apparent. I have been wondering about growing annuals next year but no space, it hadn’t occurred to me to grow them in pots until I read your post! Obvious really! Thanks, Helen. Glad to be on board. 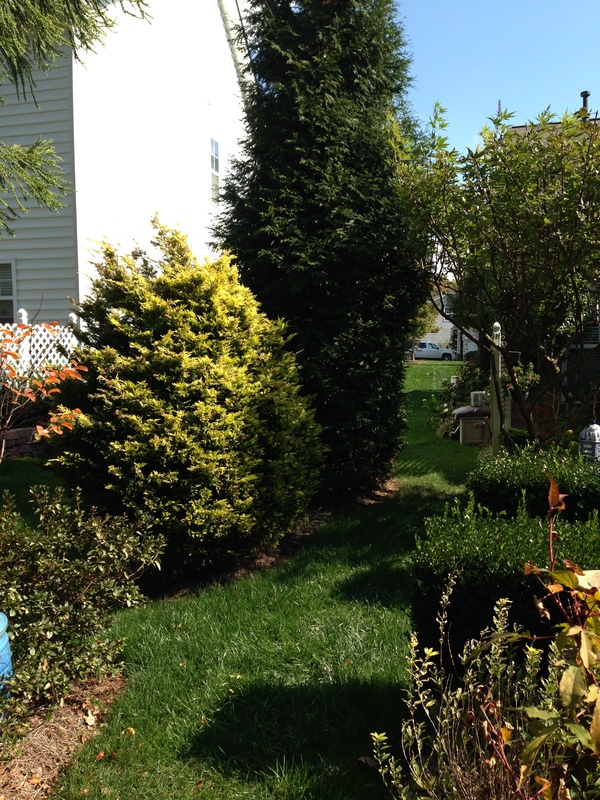 Your entire garden is very nicely planned and looks so well-tended. Thanks, Susie, for the complement. I of course, being close up, am aware of the warts.